With less than two months left until Game of Thrones Season 7 debuts on July 16, HBO has unveiled seven new photos, which showcase how massive at least one of Daenerys Targaryen's (Emilia Clarke) dragons have become. Director Matt Shakman previously confirmed that Dany's dragons will be the size of 747 jets, and that Drogon is the largest of this fire-breathing trio. 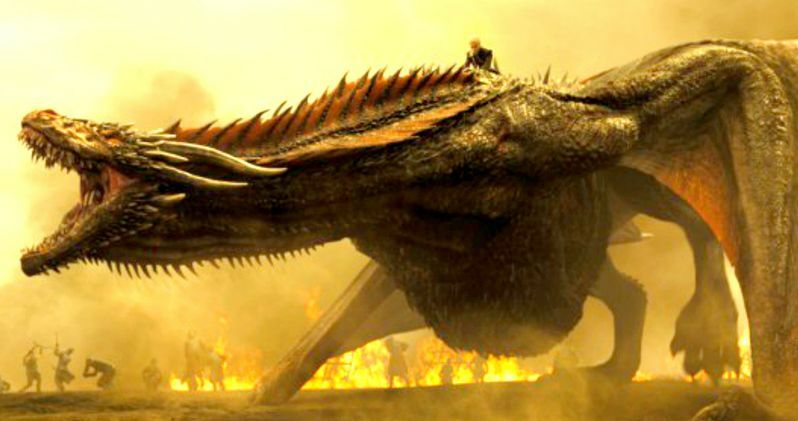 This new photo shows one of these dragons, and while it isn't specified which dragon is in the photo, it's clear these dragons are bigger than ever, especially since you can just barely see Daenerys riding atop this fire-breathing beast. Entertainment Weekly debuted these seven new photos, with this dragon image the first of the bunch. While it's clear that this photo takes place during a battle scene, it isn't revealed who Daenerys may be fighting. When we last saw Dany, she was making her way across the Narrow Sea, heading to Westeros to stake her claim to the Iron Throne, with her massive fleet and dragons in tow. It is believed that she will set up shop at Dragonstone as she plans out her attack. Normally around this time of year, we're already several episodes deep into the season, but that all changed this year when production was delayed for several months, because the show needs a colder climate to film in, since we learned in the Season 6 finale, that winter has finally arrived in Westeros. Game of Thrones started production on Season 7 in September, and we see in the second photo that the iconic Jon Snow is braving the elements, with snow falling all around him in Winterfell. At the end of Game of Thrones Season 6, Jon Snow was named the new King of the North, while fans learned of his true heritage, with the show confirming a long-held fan theory that Jon Snow is actually the son of Lyanna Stark and Rhaegar Targaryen, giving him a claim to the Iron Throne, although we'll have to wait and see how long it takes Bran Stark (Isaac Hempestead Wright) to tell Jon Snow about the greensight vision he saw that confirmed his heritage. The third photo gives us a glimpse at Maisie Williams' Arya Stark riding on horseback, although it isn't clear exactly where she is during this scene, although it's possible that she has made her way back to Westeros. Over the past two seasons, Arya has been in Braavos, learning from Jaquen H'Ghar (Tom Wlaschiha) how to become "no one." Towards the end of Season 6, Arya told Jaquen that she was going back to Westeros, and in the Season 6 finale, we saw that she got to cross yet another name off her infamous death list, when she killed the nefarious Walder Frey (David Bradley), one of the men responsible for the Red Wedding massacre that claimed the life of Arya's brother Robb Stark (Richard Madden). The final photos feature Jamie (Nikolaj Coster Waldau) and Cersei Lannister (Lena Headey) in the throne room, with Cersei sitting atop the Iron Throne and Jamie standing guard. We also get a glimpse at Brienne of Tarth (Gwendoline Christie), who flashes a smile for the camera between takes, along with another photo featuring Kristofer Hivju as Tormund Giantsbane in Winterfell, possibly waiting for Brienne. One of the more humorous story lines that unfolded last season was how Tormund Giantsbane became smitten with Brienne of Tarth, although his love appears to be unrequited, at least for the time being. The last photo features a glimpse at Littlefinger (Aidan Gillen) and Sansa Stark (Sophie Turner) in Winterfell. HBO recently confirmed that it is developing four Game of Thrones spin-offs, although very little about these shows have been confirmed. Take a look at these new photos from Game of Thrones Season 7 below.